The domestic horse’s closest living wild relative, the Asian wild horse, disappeared entirely from the wild in the late1960s. The Minnesota Zoo and other organizations around the world have cooperated to breed zoo animals and reintroduce their offspring to native lands. Today nearly 500 Asian wild horses again roam the grasslands of China, Mongolia, and Kazakhstan. 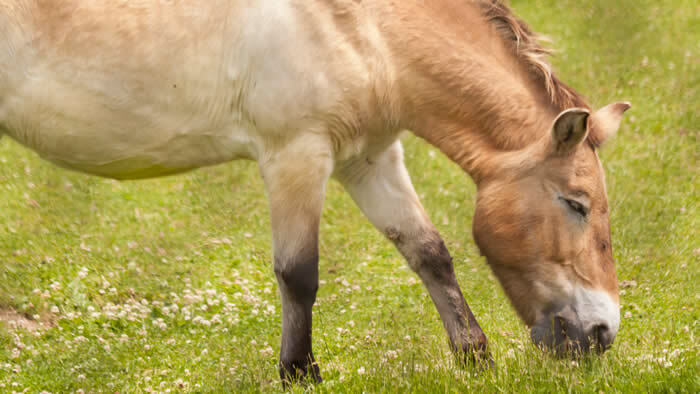 Asian wild horses eat coarse, shrubby plants and tall grasses. The grassy steppes of Eurasia are the Asian wild horse’s historic range, though in recent years humans have forced it to the borders of the stony, sandy Gobi desert. Asian wild horses live in small herds, with a stallion, several mares, and young animals traveling together as they roam the grasslands in search of food to eat. In the 1960s, Asian wild horses disappeared entirely from the wild. Since then, people have worked to preserve habitat and reintroduce animals from zoos to the protected lands. As of 2014, there are about 500 Asian wild horses living in their native habitat in the wild. Asian wild horses have 66 chromosomes, two more than domestic horses. They can successfully interbreed with domestic horses to produce young with 65 chromosomes. Unlike domestic horses, Asian wild horses shed their mane and tail once a year. All Asian wild horses alive today are descended from 13–14 horses that were in captivity when the species became extinct in the wild. Asian wild horses have been found on the grasslands of central Asia for thousands of years. However, in the late 1960s the last Asian wild horse was seen in the Gobi Desert in Mongolia. The Asian wild horses went extinct in the wild because of hunting and competition for space with livestock and humans. Despite going extinct in the wild, the species thrived in breeding programs in human care. Transfers of horses from the United States, England, and Germany helped the population grow. 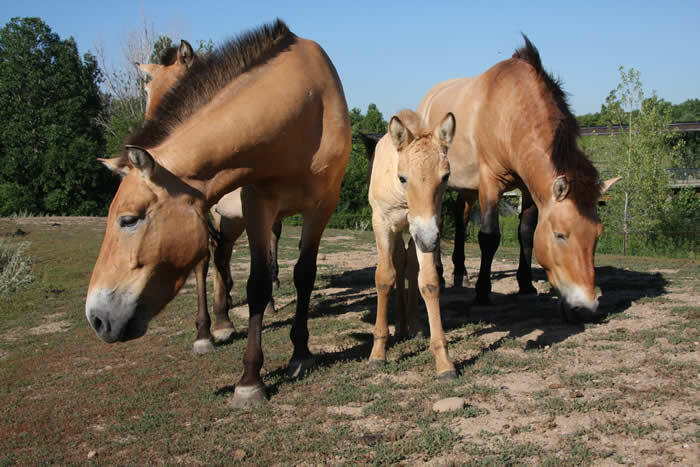 Starting in 1990, offspring of these horses were released back into the wild in Mongolia and China. As of 2014, there are nearly 500 Asian wild horses once again roaming the wild grasslands of Asia. The Minnesota Zoo has exhibited Asian wild horses since opening in 1978. In 1991, the Minnesota Zoo sent a genetically valuable stallion to a breeding program in the Netherlands. His descendants are now successfully reproducing in the wild. 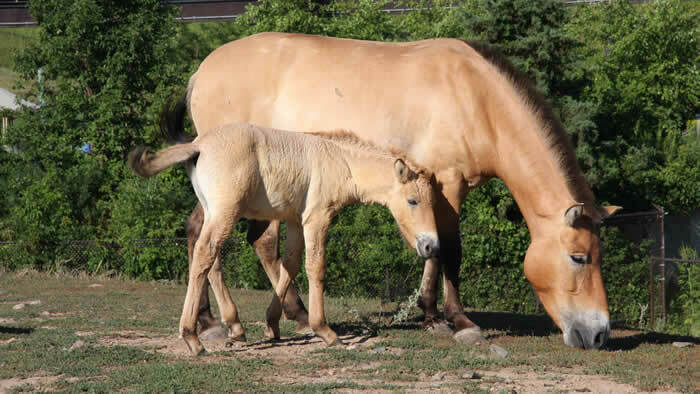 Mares and stallions from other zoos are brought to the Minnesota Zoo for breeding. The Minnesota Zoo’s Director of Animal Collections coordinates breeding of this species through the Asian Wild Horse Species Survival Plan. In the past, the Minnesota Zoo has supported reintroduction efforts in Asia through the Ulysses S. Seal Conservation Fund. Zoo scientists are currently working to save the species in Mongolia and China through active research under the True Wild Horse Campaign.